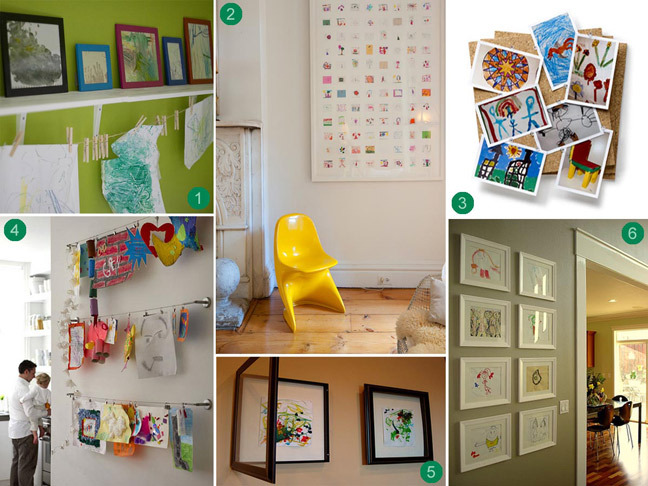 There are many great ways to display your child’s artwork, from framing your favorite pieces to hanging pictures from a curtain rod or clothes line. With so many drawings from your little artist, it’s a wonder what to do with them all! Instead of stuffing them into a file cabinet or trying to fit them all on the refrigerator, which can often leave your kitchen looking a little messy, try displaying them nicely for everyone to see. You can even take pictures of the art pieces as time goes by and eventually display one large photo like the framed compilation featured on Decor8. Coffee table books of your child’s collection also work well. To save drawings on a chalkboard, take photos of those too!